From a production standpoint, Avenged Sevenfold are literally on fire. Poised to be this generation’s Metallica, and boasting a new album that could go down in history as their swan song effort, there can be no denying the trajectory the band is on. 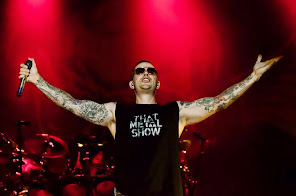 M. Shadows, Zacky Vengeance, Synyster Gates, Johnny Christ and Arin Ilejay performed on a stage adorned by a large skeleton on a throne bathed in a wall of fire as they pummelled the audience with sound, lights and bravura. Showcasing new material from Hail To The King for the first time in Toronto, fans got to hear ‘Shepherd of Fire’, ‘Hail The King’ and ‘This Means War’ along with a bevy of material from their past efforts. I found the sound for Avenged Sevenfold a little muddy, taking away from their chutzpa slightly. But the band utterly wowed the crowd with songs and pyrotechnics for seventy minutes, sending everyone home smelling like butane and smiling like they’d just seen something meaningful.